On Saturday August 22 there will be a joint reception at the Shirokane Art Complex, with Kodama Gallery, ARATANIURANO, Yamamoto Gendai, and London Gallery all participating. We look forward to seeing you then, and hope you too enjoy the summer holidays. We apologize for the inconvenience, but due to photography scheduling, the gallery in Shirokane will be open only from 2:00 pm on Friday July 31. The Roppongi gallery, however, will be open as regularly scheduled. The rainy season has finally finished, and we are now in the full grips of Tokyo summer heat. To counter that, we are displaying a refreshing screen in Shirokane at the moment. 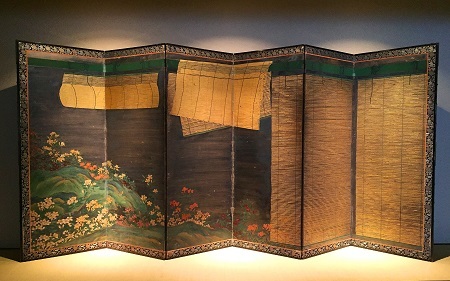 It depicts bamboo blinds rendered in a rich golden pigment, partially rolled up, revealing a garden full of summer flowers beyond. This work creates the illusion that we are looking outdoors from a cool veranda, with an evening breeze offering respite from the hot summer days such as we are having now. We are also displaying a number of ceramic works from the old kilns of Japan, with beautiful green glazes bringing them to life. 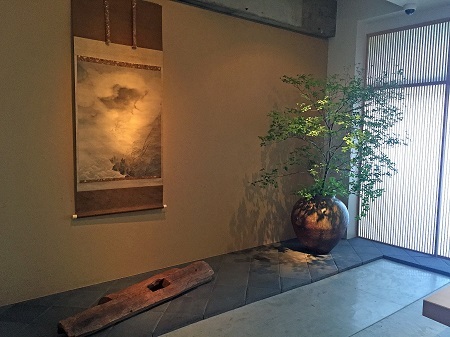 The large Echizen jar pictured here is made all the more impressive with leafy branches arranged in a naturalistic manner. We hope that you will stop by to see the show!